Yet another set of centrally planned clusters for Spokane! Can you spot the technology and bioscience innovation clusters on the list? The 2nd largest employer in Spokane – government – appears on neither list. Go figure. GreaterSpokane, Inc pushes Spokane as a great place to locate a technology business – yet by State law, technology businesses will not be supported by the State’s local higher education institutions, and several tech related agencies were shut down in Spokane between 2005 and 2008. These top down, centrally managed cluster lists change constantly. The only consistent cluster, besides government and health care, seems to be the production of economic cluster strategies. Spokane’s cluster policy is inconsistent and incoherent to the point of causing confusion that likely causes harm to the local economy. Why the push for industry clusters? via Feeling the Cluster Funk? |. Most existing clusters came about because of natural causes – as mentioned in Part 6, below, such as geography, weather or a happenstance of history (World War II, the Cold War). Observing that clusters have developed in the past into some success does not mean that governments can create their own clusters. I suspect that organic clusters do have merit; I have doubts about intentionally created clusters going much of anywhere except into a government run, centrally planned economy. The State of Washington has chosen an industrial policy known as “regional economic clustering” or “industry clustering” where the State government selects which industry clusters will operate within each of the 12 Workforce Development Areas defined in the State. The State further has enacted several state laws that require State agencies to prioritize their support for the State-selected industry clusters. State law requires agencies and programs to support the identified clusters. The side effect is that all support for businesses outside the clusters is largely eliminated. 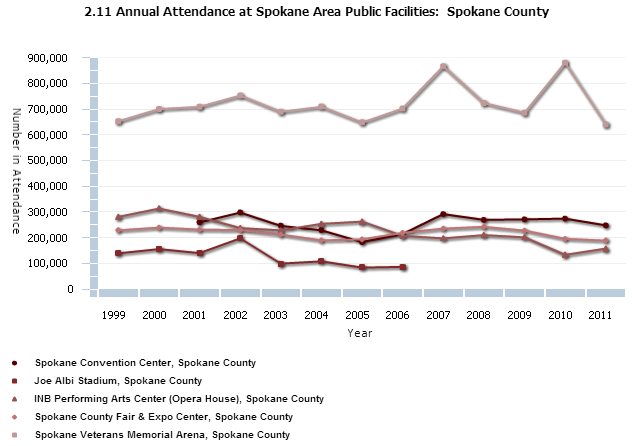 Let us look at the Spokane Public Facilities District and compare their results with their publicly stated goals. We discussed the Spokane Public Facilities District earlier this year in the context of hiding the reduction in NCAA seating requirements. Turned out that they did not need to add Arena seats for the NCAA. Read the link to learn about that. Their claims provide objective metrics to measure the effectiveness of the PFD’s management in meeting these goals. Even though taxpayers have granted the PFD every tax asked for, attendance is down over the long term. 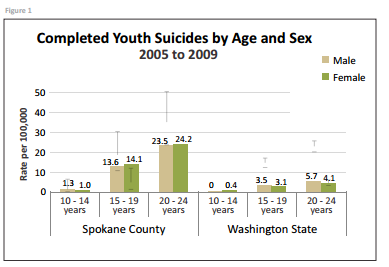 Original chart, below, is from the Community Indicators of Spokane (CIS) web site through 2011. 2012 data points and notations added by us as best we can. 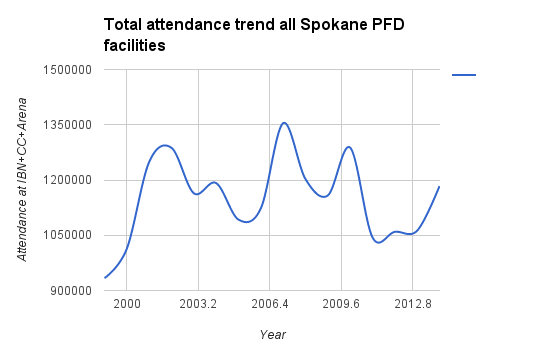 PFD facility usage, by attendance is less than in 1999 and 2001. Repeated expansions do not show increase in attendance. Follow each facilities attendance line from left to right. 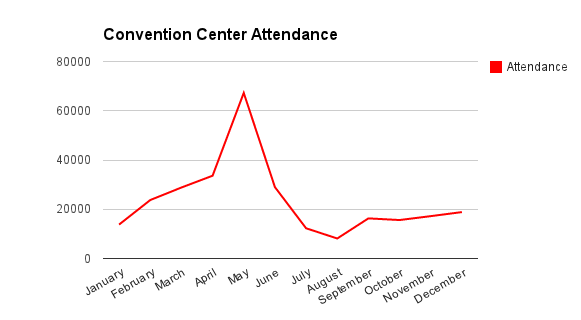 The Arena attendance line, at top, is easy to follow downwards – the Convention Center and the INB attendance figures cross in about 2006. 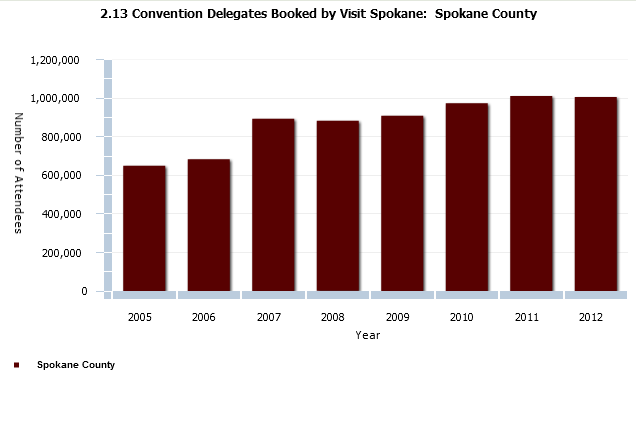 INB attendance is sharply below its 1999 level and Convention Center attendance peaked in 2002. This chart, from the CIS web site, is a spaghetti chart of crossing lines, making it difficult to see that attendance at PFD facilities has been in long term decline. Spaghetti charts are often used to intentionally hide something. Non-farm jobs in Spokane are at the same level as the mid-1990s as shown in this chart of total jobs in the City of Spokane (Chart from US Bureau of Labor Statistics). Based on the jobs data, the claim that repeated expansions of PFD facilities will increase jobs was not true (unless Spokane was simultaneously hemorrhaging jobs in other areas). Per the PFD’s economic studies, the majority of users of PFD facilities are local residents. 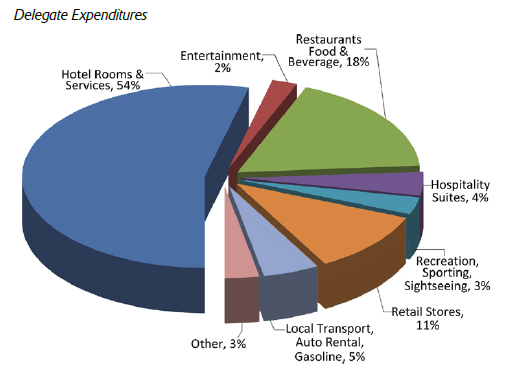 Local use is mostly re-arranging how local money is spent, moving it from say, going to a local movie theater or restaurant to attending an event at the PFD . The PFD’s economic studies, which we will get to in a moment, say that without the PFD, local residents would drive to Seattle and spend their money there instead of in Spokane (which is true for some events and some people). During the campaign to expand the PFD facilities, the PFD provided two economic impact studies. One was completed for 2007 and one for 2010 (sort of). In the latter case, they shifted the calendar to include a 12 month period with two large events that occurred at the beginning and end of the period. Sort of jiggery pokery. 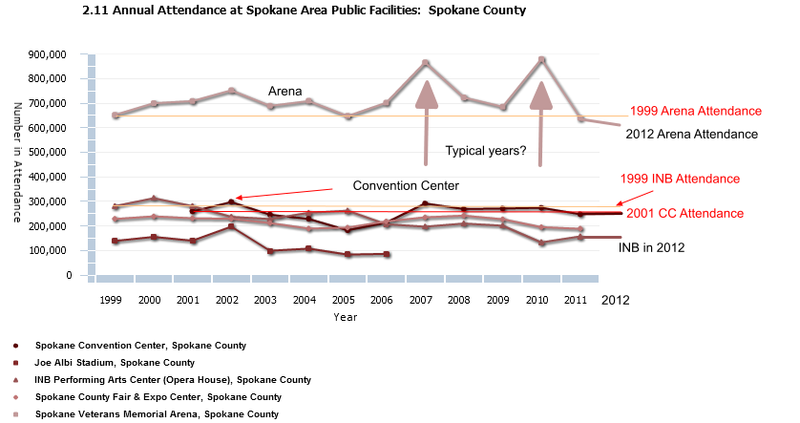 The attendance chart shows that 2007 and 2010 were not typical years for the Arena. The PFD used the two “spike” years for their economic studies. Neither year is representative of typical annual results. Both years featured prominent national events that brought more outside visitors than normal, skewing the body count and the out of town visitor count. Should Management Be Accountable for Meeting Their Own Objectives? 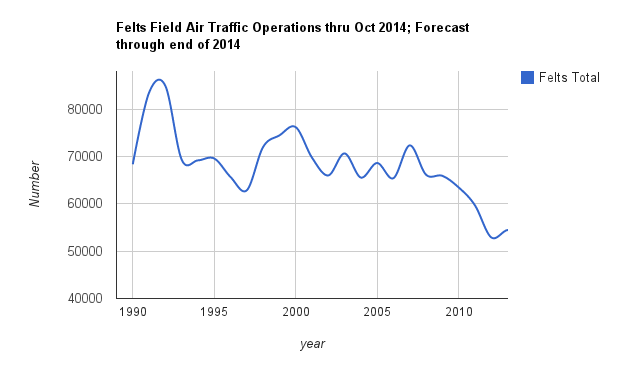 Visitors arriving by air are down to levels last seen in 1995-1996. 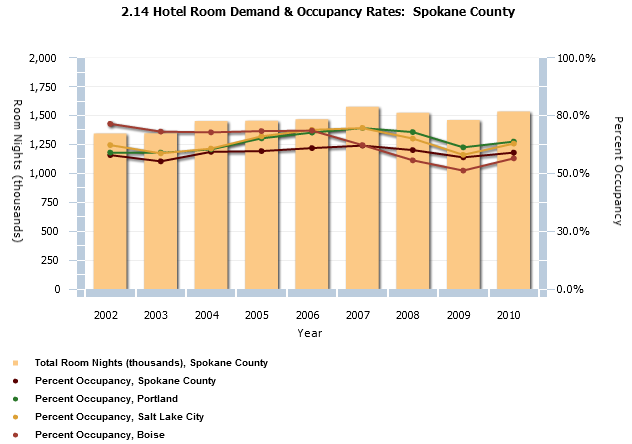 Hotel room nights are up slightly through 2010 but data for 2011, 2012 and 2013 are missing. Should the PFD management and/or Board of Directors be held accountable – such as being replaced for not meeting most of their goals? If not, then who should be held accountable? 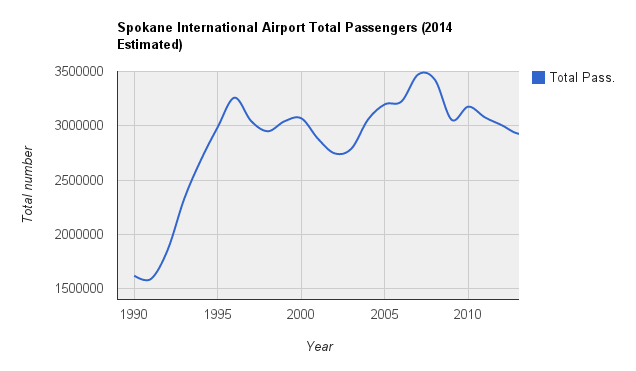 Look at the attendance chart again, then the City of Spokane total jobs trend, then the airport passenger usage. This is a poor track record. This is a management problem, not a concrete problem. Pouring concrete has not produced the desired results in the past. The heated pedestrian/bike bridge in the University district. What is an objective measure for this project? A $350 million biotech industry clusters around the bridge within 5 years? An average of 1,000 (or 2,000 or 5,000) users per day? The downtown electric trolley project. Define an objective measure for success. 40% average occupancy? 60% of costs collected from fares? Total number of riders per day? Cost per rider? Spokane leaders and agencies should be measured by objective results – not appearances. To paraphrase Lord Kelvin, if you want to improve something, measure it. To which we add: If you measure something, say something! Unfortunately, local news coverage does not report on the effectiveness of these projects – instead of a “4th estate“, we have cheerleaders. Cheerleading may happen due to a lack of resources (its easy to paraphrase a press release) – plus conflicts of interest. For example, the owner of the Spokesman-Review and KHQ owns significant parts of downtown Spokane and was tied as the 2nd largest campaign contributor to the last PFD tax campaign. Their real estate holdings benefit from taxpayer supported improvements to downtown. You can read more about these conflicts in the Seattle Times, the Spokesman-Review, the Fancher Report and the true life novel “Breaking Blue” by NY Times and Pulitzer Prize winning reporter Timothy Egan. When covering downtown issues, they rarely mention their conflict of interest. Same with water quality issues. Local news, including TV news, is mostly non-existent from Friday evening until Monday morning – its just wire service reports and stories produced during the week. Obviously a lack of resources. The Inlander and KXLY talk radio shows are the only outlets asking uncomfortable questions, when they can. Voters are kept in the dark by cheerleading – and cannot hold government accountable when the voters are unaware. A side effect is we endure tall tales, exaggerations and lies, leaving the economy stuck in neutral. This blog is going into hibernation after perhaps one more post. Comments are likely to be turned off. Update: This is a great step in the right direction for measuring local government services – but what about the PFD and other big $ capital projects (as in cumulatively hundreds of millions of $s)? Silence. Formerly known as SIRTI, the state funded economic development agency whose mission changed every few years – Innovate Washington loses state funding – Spokesman.com – July 11, 2013. Bet if the heated pedestrian/bike bridge was built, those often empty SIRTI buildings would have been teeming with industry! And it probably should be shut down. SIRTI and its successor, Innovate Washington, did not deliver close to the hype of their own PR. SIRTI started out as the Joint Center for Higher Education, then became SIRTI with a constantly evolving mission, and then became Innovate Washington. 6 Things That Can Kill Your Citys Startup Community. The co-founder of TechStars explains why communities fail to have an entrepreneurship community. He lists six broad categories that hinder startup and economic growth – and incredibly, Spokane ranks high on all six categories (most of which have been previously written about on this blog – See the History of Spokane Economic Plans and Recommendations, in links to right of this page). The May report was revised downwards to 8.8% from 9.0%. June, however, came in at 9.1%. The high unemployment level has remained constant in Spokane for 3 years running. The total number of non-farm jobs increased slightly. June and July are typically peak employment months in Spokane. Its down hill from here, until a spurt of seasonable temporary jobs around Christmas. The unemployment rate is based on an estimate of those working and an estimate of those looking for work. As can be seen in the chart, the unemployment rate can and does go down, even as the total number of those working also goes down. Which seems paradoxical but that is due to how the estimates are produced. Initial unemployment claims rose, although “continuing” claims went down. The latter could have gone down because workers found jobs or because they reached the end of their unemployment benefits and gave up looking for work. Good thing we will be cutting bus service while building a downtown trolley and pouring more concrete out at the under used Spokane (Not) International Airport! This State House bill 2ESB 5764 – 2011-12 was passed and signed by the Governor. This bill abolishes the original Spokane Intercollegiate Research Technology Institute (SIRTI). 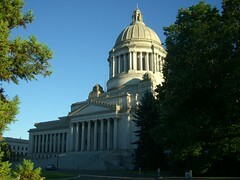 Under the bill, SIRTI will be replaced with a new state agency called “Innovate Washington”, which by law, will be required to work with public and private universities, industry and government to grow “the innovation-based economic sectors of the state and responding to the technology transfer needs of existing businesses in the state”. Innovate Washington seems to have some leeway with regards to state’s top-down, centralized planning “industry cluster” model, although its goals are aligned with a “sector-focused economy”. With regards to education, “Priority shall be given to applicants that have an established education and training program serving the targeted industry and that have in their home district or region an industry cluster with the same targeted industry at its core.” What this means is that educational programs are primarily intended to be aligned with the local region’s, state-selected industry clusters. The list of clusters selected by the state for Spokane varies from month to month, year to year, and so on. See Washington State’s Innovation Ecosystem, What Does This Mean for Spokane, Why Washington’s Top Down Industrial Clustering Policy Will Fail, Washington State Reinforces the Health Services Cluster, and Yet Another Set of Centrally Planned Clusters for Spokane. For practical purposes, your business needs to align with the State supported clusters. The eastern office will be the current SIRTI office on the WSU-Spokane campus, and the western office will be at UW-Seattle. Each campus will have a designated representative on the Board, which will have 15 members, 8 of which should come from industry and the rest are WSU/UW or political appointees. This seems to address my previous comments that the Board structure of SIRTI was disconnected from their contemporary mission. Regarding Spokane, specifically, we still need to create an innovation culture which is lacking here. That’s all I have time to write now. The Spokane County statistical zone used for economic and other data reporting by government will be combined with Kootenai County starting in 2013. 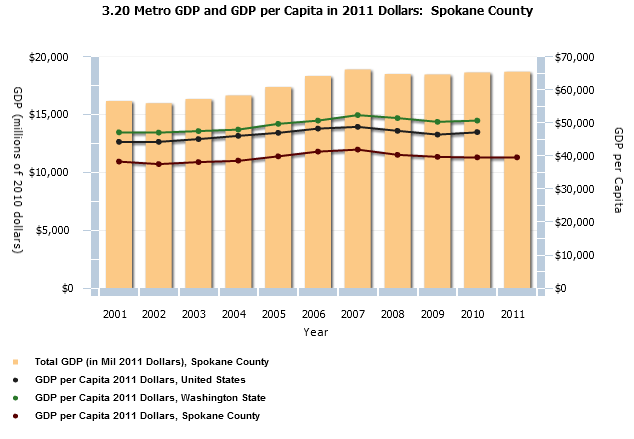 Spokane and Kootenai Counties to merge as a single economic reporting entity in 2013. Editorial: Joint identity boosts status as powerful economic hub – Spokesman.com – June 1, 2011. The main impact is that by combining two smaller entities into one larger group, the combined group moves in to the “top 100” lists of economic reporting zones. Plans, plans and more plans. Spokane has no shortage of economic plans going back decades. Please see the links in the right most column of this web page to read about past plans and summaries of what they proposed. All of them had mostly the same findings and same recommendations. Poverty and low wages are mentioned in all of them. The lack of a research university is also prominent. Let’s look at that. Former Representative Tom Foley said the lack of a research university with graduate research programs hindered Spokane’s forward progress. This idea, going back to the 1980s, led to the opening of SIRTI in the early 1990s. The Spokane Intercollegiate Research and Technology Institute (SIRTI) was created by former Speaker of the House Tom Foley, the area’s longtime congressional representative, who was convinced that the lack of a top-notch research facility was a factor holding back Spokane’s economic progress. Initial funding came through a federal grant, and it is now supported by state funds and fees paid by participating companies. Source: 2003 Brookings Institution study and Ten Years of Innovation (SIRTI publication). “Spokane is not at the forefront of higher education. Lack of a major research institution has consistently been called a weakness as community officials assemble a 21st-century information-based economic curriculum.”- Bert Caldwell, Spokesman-Review newspaper. Foley and others helped the Spokane Intercollegiate Research and Technology Institute – which was supposed to create spin offs from local university and government lab research into start ups and industry, and assist other start ups in creating a thriving community of science and technology start ups (some historical background). To answer the challenge, the Washington State Legislature, with local guidance, created the Spokane Riverpoint Higher Education Park and created the Joint Center for Higher Education JCHE. The JCHE mandate was to catalyze a high tech sector, begin the effort to provide high tech worker education programs, and to be the administrative agent for the newly created Spokane Intercollegiate Research and Technology Institute SIRTI. The JCHE was to spur university collaboration in teaching of computer science, biotechnology, and other technology classes; collaboration in research projects especially with industry partners; and foster high-tech worker education and training programs. SIRTI was to be operated as a research and technology-facilitating institute that would provide grants, independent research laboratory space, project management help, infrastructure, and the capability of scientists from all local colleges and universities to collaborate. SIRTI was structured with a Board dominated by academic and government labs due to the thinking that its mission was to move academic and government lab research into the private sector. Over the years, its role has morphed. Today SIRTI is an economic development agency working to help science and tech start ups state wide. Sirti accelerates Inland Northwest technology-based companies toward success and positive regional economic impact. We deliver entrepreneurial coaching, a mix of no- or low-cost business services, access to capital, and the legal services needed for successful formation, IP protection and long-term growth. Update: There is a bill pending before the legislature that would merge SIRTI and the Seattle-based Washington Technology Center and …. reconstitute the Board so that it was no longer dominated by academic and government agencies. The bill is here. The Innovation Economy author saw incubators, like SIRTI, trying to substitute for the “dense networks” that exist in innovation ecosystems by providing “access to mentors, peers, enablers, resources, education and information”. But … there is always a but … at the cost of requiring “exclusivity, requiring an extremely high level of success prior to providing assistance, and requiring the use of in-house services”. The best technology transfer program comes from the students themselves, not from government agencies set up to create university technology transfer (SIRTI). We need undergraduates and graduate students who pursue their own entrepreneurial instincts to turn great ideas into even better ideas. The real world path from lab to start up goes through undergraduate and especially graduate research students working in research labs, who license or take ideas from the labs in to their own start ups. This may explain why we do not have the rich ecosystem of science and technology start ups that were originally envisioned. We’ve got SIRTI. But we do not have the graduate research students who are a critical path to migrate great ideas into profit making ventures. We also lack the graduate education opportunities that attract ambitious students to the area – most all of these students must go elsewhere to get the education they seek and then probably go to work some place else too. In other words, perhaps the model is broken. It sort of worked but looking at the local economic numbers and the local ecosystem, it did not achieve the orbit that was originally planned. Total jobs here are now down by 10% over the past decade. Please do not conclude that SIRTI is not working. That is not the message. The message is that a lot more might have happened if we had the rest of the ecosystem. I previously documented on this web site, that we have close to zero graduate degrees in science, technology and engineering available in this area. Follow the links to learn more. More information here. And enrollment in undergraduate technology fields has fallen by 2/3ds. WSU-Spokane has big plans to greatly expand its health science programs in Spokane in coming years, including moving its College of Pharmacy from Pullman to Spokane. As many observed since the 1980s, without graduate programs in multiple disciplines, Spokane’s innovation economy is ham strung. Do we have what is needed for a 21st century innovation-based economy? 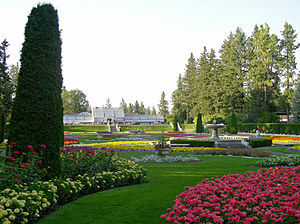 Spokane is the 2nd largest city in the State and the County is the 4th largest by population. While WSU-Spokane will grow larger, so will the others. Spokane’s campus is the smallest and now its the slowest growing. Why? Local promoters have asked the State to open a 2nd medical school in Spokane. That would be a great asset but due to funding, the Governor says not until sometime after 2021. This doesn’t feel right – Is Spokane being short changed? Have we aimed high enough? Way back in the 1980s, local leaders identified the lack of a research campus as a weakness. We settled for SIRTI and the smallest of all research branch campuses in the State, plus a fine non-research university (EWU, and also GU and the smaller Whitworth). Some one suggested to me that this is due to the area’s culture-“we settle for good enough” rather than consistently aiming high, seeking excellence and really doing what it takes to compete on a world class level. To clarify that comment, there are people here who seek and deliver excellence, but I understand what is being said and hopefully you understand too. Doing “good enough” shows up in the data (e.g. low participation rates on high school SAT exams). Anecdotally, I’ve run into this “good enough” attitude many times myself. We settle for good enough. It’s a nice place to raise a family. There’s lots of golf courses. It’s a nice place to retire. It’s near nature, near good enough. But good enough will not be a winning strategy in a globalized economy (unless we settle for regional services where we have some regional market power). Someone else hints a good enough mind set could have been a factor in why Agilent left town (see the next couple of comments there).. I have no idea, those assertions could be right or wrong. Why not think big, on the order of another World’s Fair Expo? How about an all out effort to put together all the pieces for a comprehensive innovation based ecosystem? Not just bits and pieces but the whole deal? What Does This Mean for Spokane? Unfortunately, local leadership (and state law) has us headed down a path through an incoherent industrial cluster strategy. We need to build the whole ecosystem and stop drawing ever expanding geometric shapes on a map to proclaim we have clusters that we do not actually have. Let’s invest in people and ideas, not concrete. Do not settle for anything less than excellence. Odds favor that we continue to pour concrete to eternity, wages will be unacceptable, ambitious people seeking excellence and and young people with skills and seeking opportunity will head for the coastal cities. Like they’ve been doing for some time. Read what Timothy Egan wrote about Spokane in the NY Times. “Good enough” and “pouring concrete” are possibly the root cause issues to address. That would make for an interesting discussion topic. For those that asked for recommendations, there you go! I could be completely wrong, but at least its different than 30 years of existing plans and strategies. The alternative is to settle into a collection of regional service industries which is what we have today. Government is a service, health care is a service, and most of the next largest sectors (retail, hotels and restaurants, business and professional services) are services meeting the needs of the two big kids on the block (government and health care and their work force). Those that prefer to compete at a world-class, globalized economy level in fields other than government and health care, local service and niche market industries, will find better opportunities somewhere else. Fair enough. But we will need to re-align our local promotional efforts with this goal (they are not now aligned). And we will still be stuck with our stubborn wage problem: except for the big government and health care sectors, most of our remaining services sectors do not pay well. Some local agencies and organizations provide some data, and some times, information, on their web sites – but sometimes they practice “hide the decline”. We do not know if this is due to lack of resources, is inadvertent, is an “honest mistake”, is due to sloppiness or carelessness, incompetence or deliberate decision to hide something, or that my common sense interpretation of what I see is just weird. We don’t know. These examples involve good to outstanding organizations who are usually doing good to outstanding work. These comments are intended as suggestions for improvement and should be taken that way. They may be embarrassing to a few people – I am sorry if that is the case. The goal is to show how improvements can be made to make these items better! SIA is a fine airport and has done a lot very good things. But sharing data? Not where they need to be. I’ve covered this item already and am repeating this here in part to show what it took to get to the actual data and turn it into useful information. you obtain the full file directory of older data going back many years. While painstaking, each monthly report can be transcribed, by hand, into spreadsheet, and turned into a useful chart. Hidden deep within this file directory is a document named historic.pdf that provides historic data. 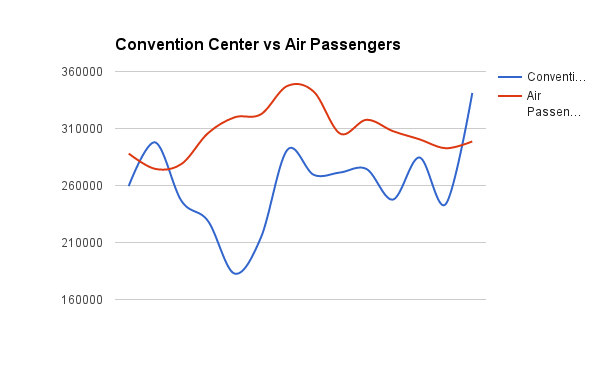 There is no clickable link on the airports web site to access this data. But the file becomes visible if you use the trick to truncate the URL as shown. Regardless of the effort to get to the data, it should not be hidden. SIA should have charts up on their web site. Making it visible would help local leadership make informed decisions. When this data was combined with a forecast chart in the airport’s master plan (issued in 2000), we saw that the forecast was wrong the year it was issued and deviated further and further away from reality every year since. The forecast part of the chart had to be interpolated from a chart printed in the master plan; the data was not available. The airport management announced in the fall of 2010 that they would – ten years later – be updating their master plan with a revision expected in 2011. I tried to identify the money spent on infrastructure improvements at SIA over the past decade. That information is not obviously available on the SIA web site. I eventually found it in an EWU study on economic effects of the airport (about $190 million of improvements over the past 8 years). Historic and trend data on revenues and spending should be easily available to the public so we know how our fee and tax money is being spent. This applies to all local governments. I think SIA is a fine airport – the new airport director and management will likely do a better job of sharing important information with stakeholders in the future. I am big supporter of WSU; we need more support for higher education in this state, not less. And I will discuss that further in Part 3 and Part 4. With that in mind, I found the following example to be funny. The following text appeared in the 2010 press release on spring semester enrollment. Similar wording was used in 2009 and 2011. Can you spot the odd one out? The university’s fastest-growing campus continues to be WSU Tri-Cities, which enrolled 1,508 students, an increase of 160 or 11.9 percent over last spring. Enrollment at WSU Vancouver is 2,892, up 105 students or 3.8 percent over spring 2009. The Pullman and Spokane campuses, which are considered one campus for state enrollment reporting purposes, showed an overall increase of 1.3 percent or 265 students over spring 2009. The Pullman campus enrollment is 18,629 students and WSU Spokane has 1,311 enrolled for spring. When the enrollment rose at branch campuses, the enrollment increase was highlighted. For WSU-Spokane, only an enrollment number is provided. That’s a data point – not information. The omission of whether there was an increase or decrease made me laugh – this is a press release issue. The local media never noticed the decline in enrollment at WSU-Spokane. WSU has an Institutional Research office that provides a lot – a TON of data – on enrollments including in downloadable .xls spreadsheet format. 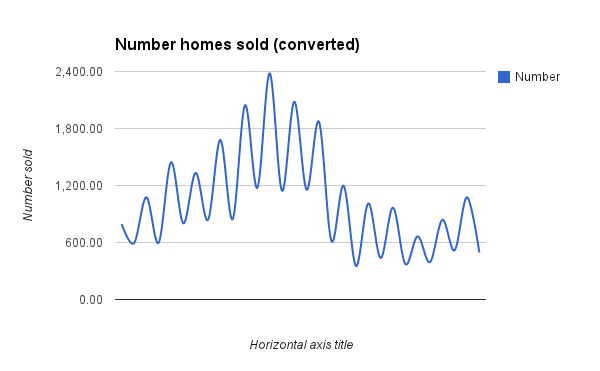 Charts would be nice but with easily accessible data, we can create our own charts. WSU (overall) and the IR group are doing a great job. The chart above and below are produced by me from the enrollment data provided by WSU’s Office of Institutional Research. 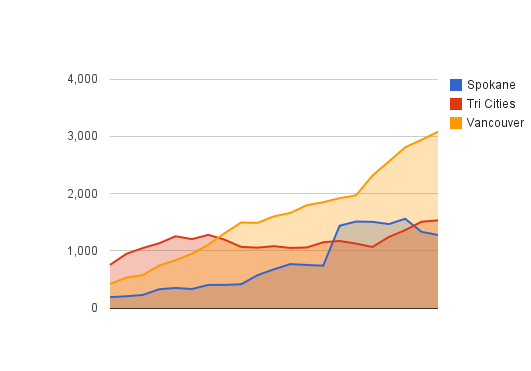 It is hard to see but the blue line, which is Spokane’s enrollment, goes down. I created this chart and an accident of how I made the chart presents an interesting way to hide a decline – just cover it up with other lines on the chart! This is a common technique but blame me for this chart, not WSU! 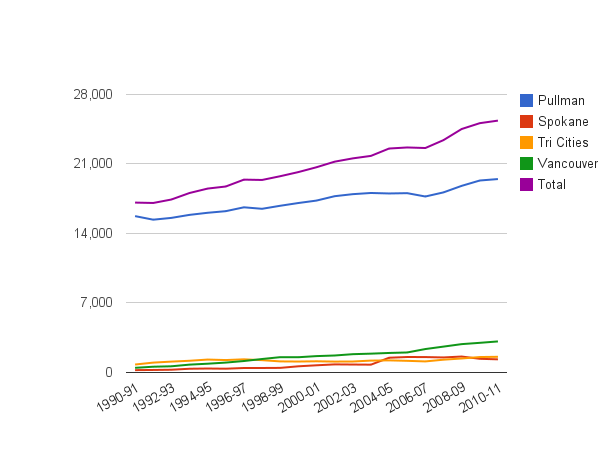 To see the decline a bit better, here is a chart showing only the branch campus enrollments. The blue line and section represents WSU-Spokane. WSU provides a lot of great data through their Institutional Research web site. It could be improved with more charts – but they are to be commended for providing the raw data. But the press release wording-that’s just funny! The WSU-Spokane campus will be revisited in Part 4. It would be helpful if local news would present trend charts showing how things have changed over time. Typically, they present the raw number someone put in the press release (like the above). Without seeing the historical trend in news reports, the story is just noise and not useful information that the reader can use for understanding. For example, compare seeing today’s stock report with no knowledge of where the market has been yesterday, last month or during the past years. Which is more useful? A single stock price quote or a chart? Numbers in most news stories are just numbers and devoid of important context. When I tracked down the companies that left the area or downsized, it was hard to find out how many employees the companies once had. When a company folded or moved out, and if the closure was even covered (we cover new business openings but sometimes miss closures) some news reported the loss of employees as of the last day. But most of these companies had been downsizing for a period of time. I saw one report that said when Agilent closed, it was the loss of 99 jobs. Really? The company had been downsizing from a high of at least 1,500 staff. Some old reports said that when contract workers, consultants, on-site vendors and others were included, the site in Liberty Lake might have had nearly 2,000 people total (SR news article quoting former Agilent Human Resource manager). Seeing the total loss in context – from between 1,500-2,000 workers is quite a bit different than reading about a loss of 99 workers (update: the SR, by the way, reported this with the full context). When Itronix closed, 380 workers were affected. But just before that, the company had 450 workers and may be even 520 said some old news reports. Seeing the full context helps us understand the overall impact of a business that is growing, shrinking or closing. With all the cutbacks at the local media, I assume they lack the time and resources to do the job that they really want to do (I think this is the main issue). The problem affects many stories. For example, reports about local and state budgets never show us past budget plans, actual spending or tax revenues or trends in those values. This is critical information needed for the reader to put the present situation into historical context and see what trends there might be in spending or taxes. And then there’s the happy talk news – read the comments to this news story – especially the one by “Zelda” … see how leaving out the context creates a “fake but accurate” style of report. Local Government – More Info Please! Most local government agencies need to greatly improve their data reporting to the public. How has their spending changed over time? Their staff? Their revenue collection? What metrics do they collect to monitor their effectiveness? Do the metrics show improvements over time? GreaterSpokane, Inc – Pick Cherries! A time honored technique to minimize a decline is to just move the start or end points of your graph – delete the data you would rather others did not see. The “trick” here was to set the start to 2004. In reality, the local patent production rate fell by -75% since the late 1990s. The chart above may have been due to insufficient research, an “honest mistake”, carelessness or that someone else handed them the chart and they just republished it. They may not have been picking cherries. GSI’s job is to promote the region. Understandably their focus is promotion and to highlight the positive. However, as a means for understanding our local economy and planning purposes, GSI’s reports can be misleading as they focus on the positive and miss the negative. GSI’s web site also has a lot of out of date information. They need to audit every page – and verify that every claim is still true or meaningful. For example, about 25% of their list of top local tech employers are either out of business, not actually tech companies or not local. Various local web sites also have lists of “awards” or proclamations by magazines about life in Spokane – but most are undated. Tracking some of them down, some are old and no longer mean anything useful about today’s Spokane. There are other examples but you get the idea. As we will see in the next two examples, when we see sloppiness, it makes Spokane look dated, quaint and out of date. We can do a lot better than this! Terabyte Triangle – Spokane is a High Tech Hot Spot! This phrase “Spokane is a High Tech Hot Spot – Network World Magazine” appears on many local promotional web sites. Unfortunately, it is not what Network World actually said. What Network World actually said all the way back in 1998 was that “Spokane is not a high tech hot spot, but is warming up“. Inaccurate claims such as that are sloppy or untruthful. Take your pick. Who knows where this phrasing first appeared – its on several local web sites and I suspect the claim developed a life of its own. This is a very useful web site with great information about downtown happenings. But like the above, some pages are hopelessly out of date. The “more miles of fiber per capita than any other city in the nation” is really, really old. No source has ever been provided for this old claim. Only 20? Hello? It’s 2011 and this may be a surprise but in many parts of the country, personal homes even have fiber optic connections today! Spokane is already home to high-tech firms including General Dynamics, Cyan, Vivato, Telect and Itron. This clustering of mutually beneficial businesses provides a synergism that attracts businesses providing support services to help high-tech companies grow. Except the quoted CEO was with a start up that is no longer in business. Nice quote, too bad its not quite relevant anymore. Other pages (and here too) are dated and should be brought up to date. The above is just a small sampling of questionable data and claims seen on local “official” web sites. Have you spotted a pattern in promotional web sites? They are often old and out of date and say things that are no longer true. 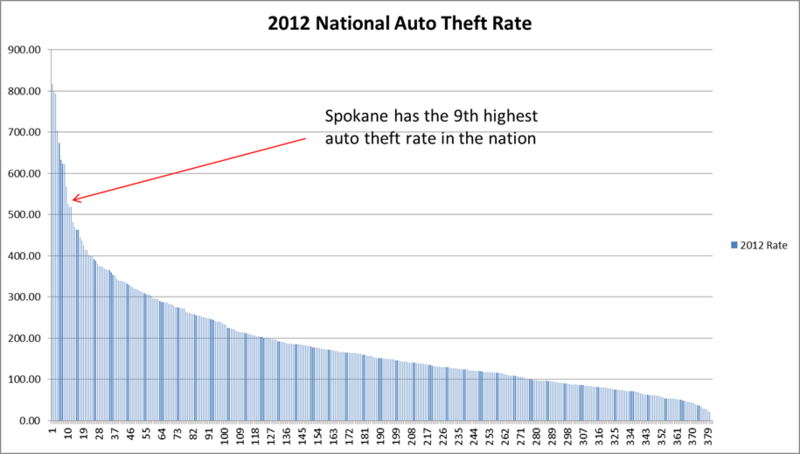 Collectively it reflects badly on Spokane. Attention to detail? Not here. Inaccuracies and incorrect claims do not help promote the area at all. I am sorry these observations appear embarrassing to some local groups. Whether I write about them here or not they are out there for the world to see and they are embarrassing. Let’s pay attention to details and fix them and make these web sites even better! For what ever reason – honest mistakes, laziness, sloppiness, lack of attention to detail or perhaps “hiding the decline”, the sort of things described above – and those are only a partial list – suggest “good enough” is common here. Parts 3 and 4 will address why good enough is not good enough – we need to aim high and seek excellence. On a brighter note – Good ideas come from other good ideas! Good ideas come from analyzing, synthesizing and understanding what we see around us. Getting an accurate picture of the situation in Spokane and at local institutions will help all of us know where we are and help us to make better decisions to get to where we want to go! Local agencies need to be producing useful information, not just data points (see Part 1). Local agencies and organizations need to making their useful information readily accessible to everyone (Part 2). Local agencies and organizations need to provide accurate information. The more accurate data and useful information that all of us see, the better the quality of our decision making! Accurate data, portrayed accurately is best for all of us. All of the mistakes above (and that is just a sample) when seen together portray an area that is sloppy or careless. This does not make Spokane look good. For those of us who consume data and information, keep your eyes wide open for sloppiness in the data provided to us – be skeptical! If you have responsibility for any of the above – let’s fix these and make them better! Part 3 reviews the low wage problem and hypothesizes that we’ve been investing in pouring concrete for far too long. For the 21st century we need to invest in people and ideas, not more concrete. Part 4 follows up with more on our concrete obsession, but adds that we seem to aim low instead of aiming high. 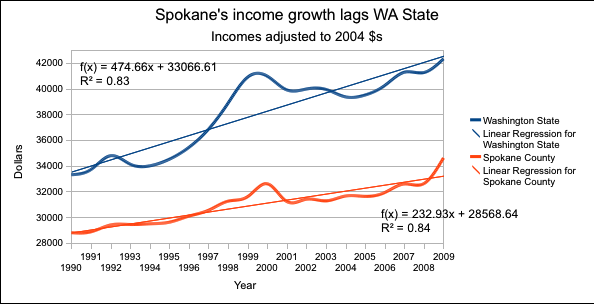 Notice anything unusual about the wage distribution in Spokane County? This chart is an attempt to capture the relative impact of industry wages, by sector. The normal way of looking at sectors is as a count of total employees in each sector, or sometimes as average wages by sector. This chart is a little different. The data comes from the WorkForceExplorer. 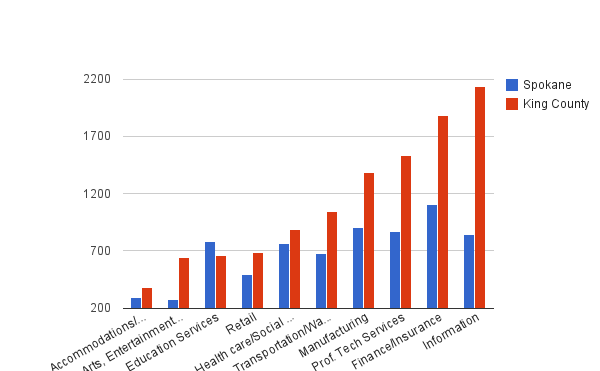 The average wage for each sector, from that data source, is multiplied by the percent of the workforce of each sector. 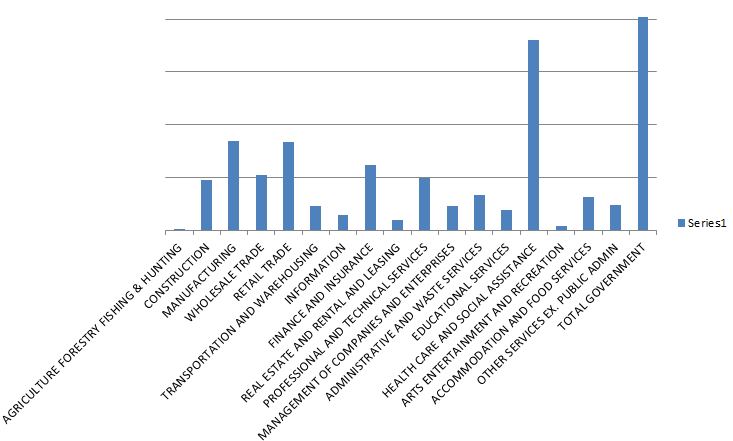 This weights each sector according to income (or if you prefer, weights income according to sector). 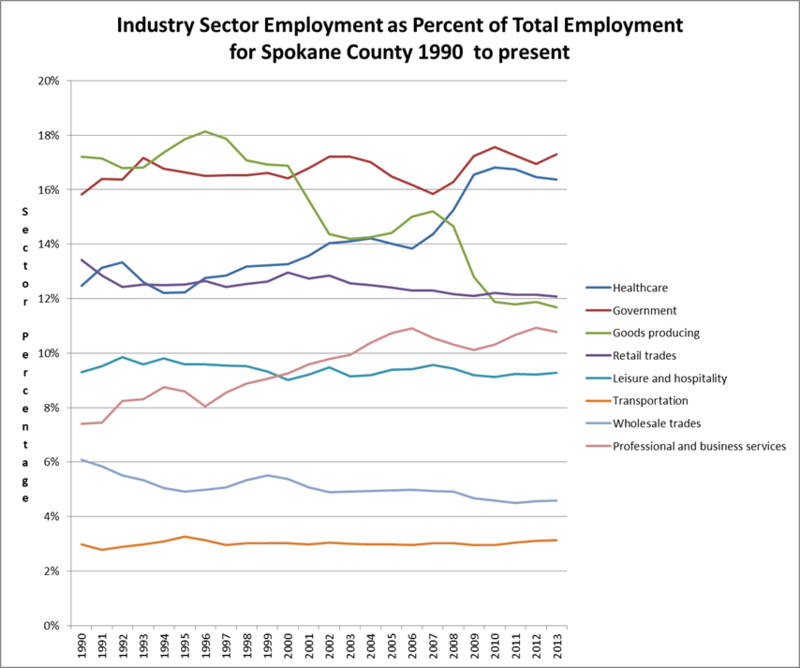 Government and health care combined are just over 40% of all wages in Spokane County. (WorkforceExplorer produces a similar chart as the above but sorts the columns and draws them as a horizontal bar chart. Our brain judges relative sizes in the vertical direction better than in the horizontal direction. When the columns are left unsorted, and drawn as vertical columns, the distribution of wage income is apparent.) The government category, as provided by WorkforceExplorer includes public schools and colleges. Retail trade accounts for two-thirds the number of jobs found in health care and government but wages are very low. When the impact of retail trade is weighted by the low wages the importance of retail wages falls to a low level considering how many people work in retail. 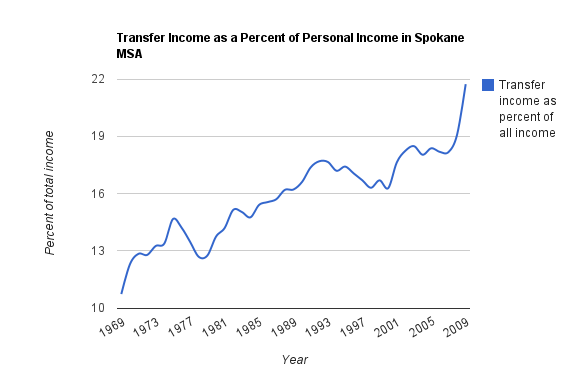 If you squint at the chart for a bit, you can see that Spokane has two large clusters: government and health care. Plus three small clusters: manufacturing, retail trade and finance and insurance. The latter two are not really competitive advantage clusters – every comparable city has similar sized retail and finance industries. 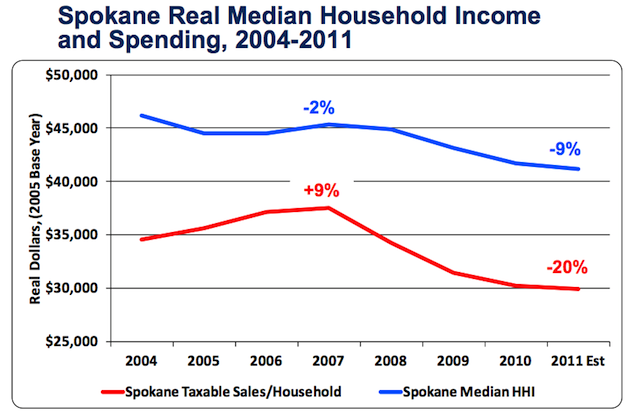 In seriousness, the chart shows that Spokane does not have a diversified economy. Related: the incoherent cluster strategy that I have described elsewhere on this web site does not include government as a cluster even though it is the largest employer and produces the largest portion of wages. Another component not shown is that transfer payments, primarily from government, for unemployment, disability, retirement and other benefits programs are not included. These total almost 20% of all local income. There is not an easy way to include this data in the above chart (we do not know how many recipients there are nor how to split out the portion of benefits that would end up being counted in health care). If we could include the transfer payments, the top three clusters would be government, health care, and transfer payments. This is no way to run an economy. What it does not mean – this chart does not directly reflect wages in each category. For example, Management shows up as a small column but the average wage in this category is very high – but has relatively few people working in that category. Health care and government wages, on average, are slightly higher than the overall average (about 10%), but the relative size of the columns in the chart is due to how many people are employed in those categories. Update: If the medical school is ever built in Spokane, the economy will become even less diverse as the proportion of income due to health care will rise much higher. Should we have a diversified economy? Do we want to have a diversified economy? How do we develop a diversified economy? What steps need to be undertaken to diversify the economy? Are government policies enhancing diversity or limiting diversity? What new policies are needed to improve diversity of income sources? Is data, such as the above chart useful for decision making? Today’s Spokesman-Review Office Hours blog: “How Seattle Transformed Itself? Any Lessons for Spokane?” The issue of smart people, the influence of clusters of smart people and how they are transforming cities globally. Something I have written about on this web site extensively. Now we’re talking! 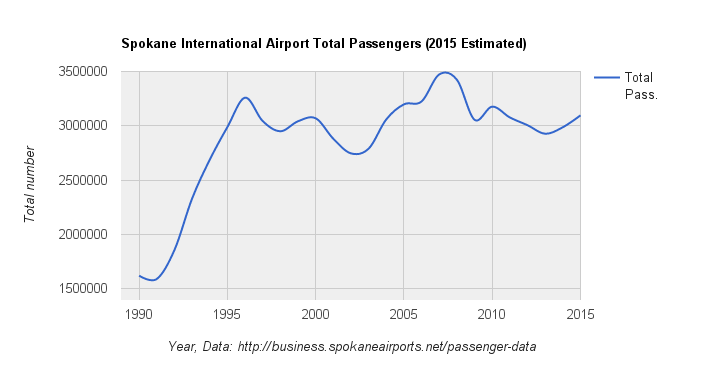 The government has already poured hundreds of millions into Spokane International Airport. The result of that can be seen in the charts below. AIRWAY HEIGHTS, Wash. — Senator Maria Cantwell and Mayor Mary Verner came together Sunday to address the local implications of the U.S. Senate passing the FAA Reauthorization Bill. Both say the bill could bring millions to Spokane International Airport for technology and infrastructure improvements. via FAA Bill Would Bring Millions To GEG – News Story – KXLY Spokane. 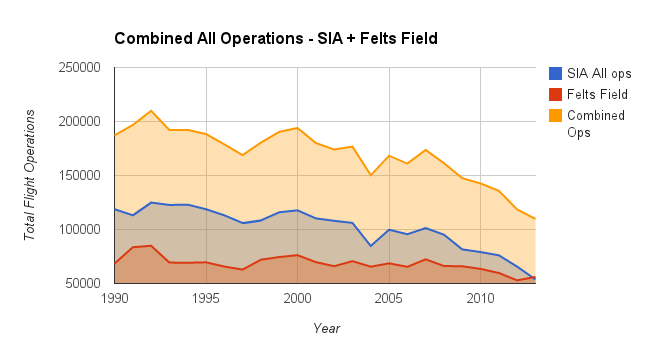 The following charts show the result of continued spending on SIA, where passenger counts and cargo have been flat for 15 years. 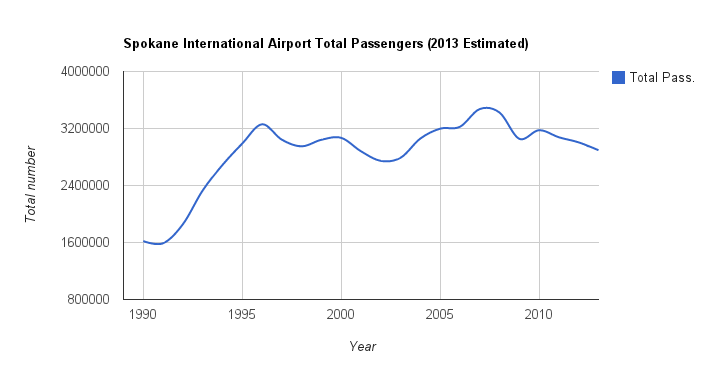 In both 2009 and 2010, there were fewer passenger boardings than in 1996. Source for the following charts: here, here and here.